You can format individual shapes to add emphasis, distinction, or a unique color. You can change fill color, line color and other line options, rotate shapes, and arrange shapes. You can also quickly add a professional style to all the shapes in your diagram by using themes and theme colors. 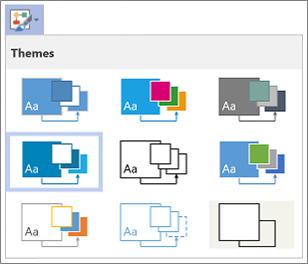 The Shapes palette reflects the current theme you have selected. Themes can even be different for each page in a diagram. To fill the shape with a theme or standard color, select Shape > Fill . You can also adjust the transparency or opacity to reveal a shape or text behind it. To change the shape outline and color, select Shape > Line . You can also change the line, weight, dashes, or arrows (if you have selected a connector line). On the ribbon, select Design > Themes . On the ribbon, select Design > Theme Colors . 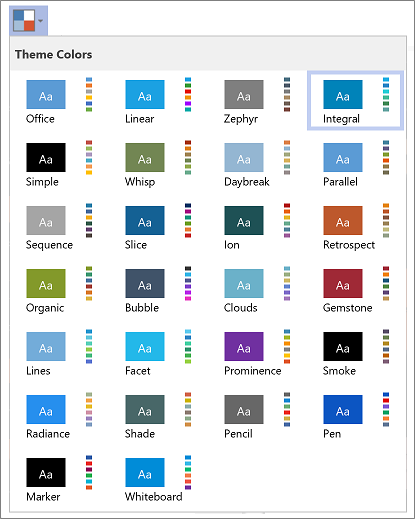 Select a theme color from the list.